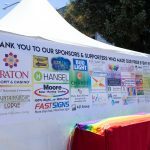 Sonoma County Pride is proud to offer the Community Sponsorship Program to our small local non-profit partners! Small non-profit organizations who are not able to afford the registration fee can apply to have their parade registration fee covered by one of Sonoma County Pride’s sponsors. A limited number of fee waivers are available and each one will be reviewed by the board of directors.